Every once in awhile, a very special property, a rare gem, becomes available. This is one of those gems. This stunning one and a half story home with an open, airy floor plan has been meticulously maintained and enhanced for easy living and entertaining. 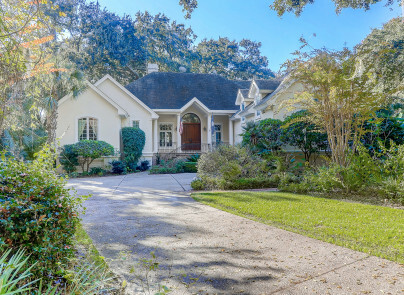 It is located on an estate sized lot, boasting a masterfully designed Charleston garden on nearly one half acre! Nestled between two scenic golf holes and the magnificent garden, living here one is surrounded by beauty, privacy and nature. Upon entering the house, your eye is drawn through the living room with its grand fireplace and soaring ceiling to a wall of windows affording long views of the golf course.